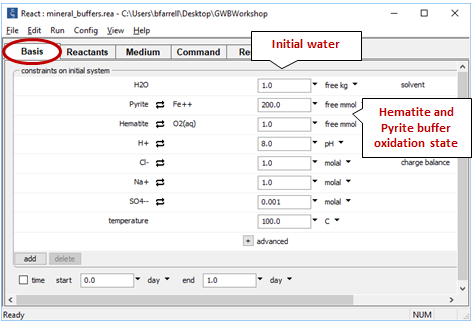 Geochemical Buffers is part of a free web series, GWB Online Academy, by Aqueous Solutions LLC. The heart of a geochemical model is the equilibrium system, which contains an aqueous fluid and, optionally, one or more minerals. The system’s constituents remain in chemical equilibrium throughout the calculation. 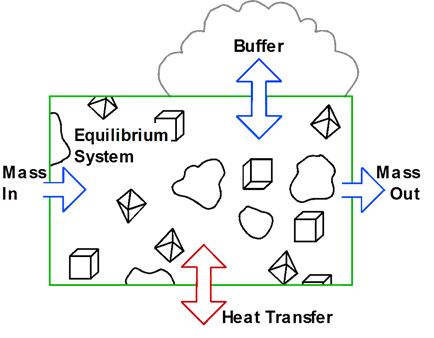 Transfer of mass into or out of the system and variation in temperature drive the system to a series of new equilibria over the course of the reaction path. 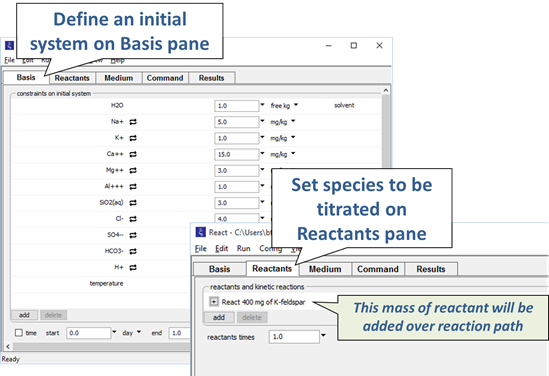 In this section, we consider how to construct reaction paths that account for the effects of simple reactants, a name given to reactants that are added to or removed from a system at constant rates. 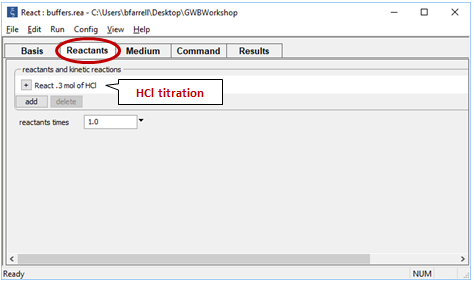 We commonly refer to such a path as a titration model, because at each step in the process, much like in a laboratory titration, the model adds an aliquot of reactant mass to the system. 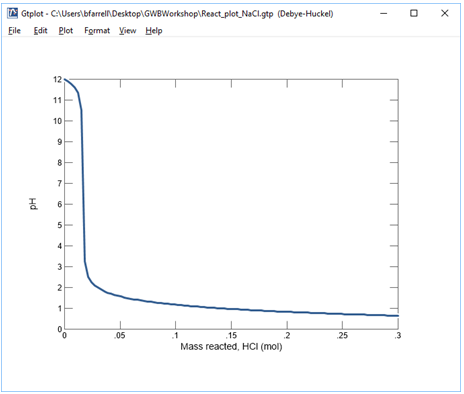 As an example, we could simulate the hydrolysis of potassium feldspar. We would specify the composition of a hypothetical water, then define a reaction path involving the addition of a small amount of feldspar. The calculation procedure for tracing a titration path is straightforward. We begin by calculating the equilibrium state of the initial system. We then incrementally change the system’s bulk composition as a function of reaction progress. 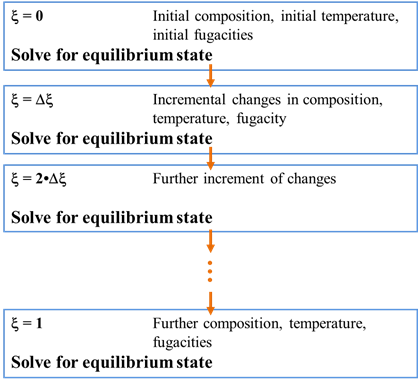 After each increment, we recalculate the equilibrium state. 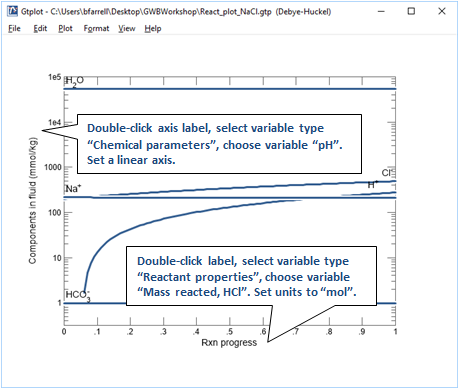 In this lesson, we’ll look at how we can use React to model reaction processes. We’ll consider how species and minerals can serve to buffer the chemistry of natural systems. We start by looking at how dissolved carbonate affects how readily a solution can be acidified. 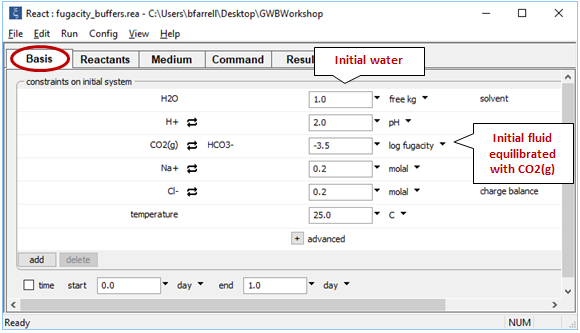 The Basis pane contains the unreacted water, a dominantly NaCl water at pH 12. Here we’ve defined a reaction path in which we’ll titrate 300 mmol of HCl into the initial fluid. 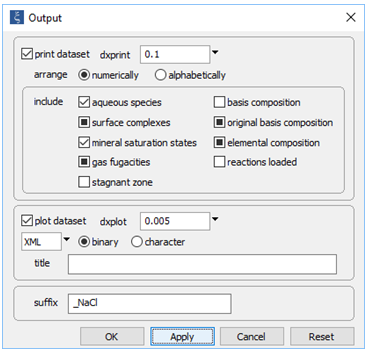 Click on the Plot Results button to launch Gtplot. On Config → Output… set a suffix “_Na2CO3” and rerun the simulation. Again, plot pH vs. HCl reacted. 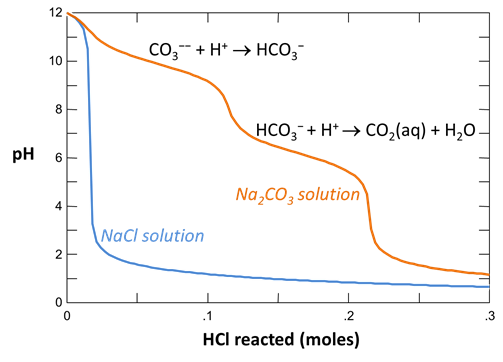 Why do the curves for the NaCl and Na2CO3 solutions differ? How did the pH of each water change as acid was added? The NaCl solution is quickly driven acidic. The only buffer is the presence of OH- ions, which are quickly consumed by reaction with H+ to produce water. The Na2CO3 solution, on the other hand, resists acidification until more than 200 mmol of HCl have been added. The two plateaus represent the buffering reactions between CO32- and HCO3-, and between HCO3- and CO2(aq). When all the CO32- and HCO3- species have been consumed, the solution quickly becomes acidic. Plot the distribution of carbonate species in the second water vs. the amount of acid added. Choose a linear scale for the species distribution. Compare this plot to the plot above. Considering the slopes of the lines in this plot, what reactions occur among the species? The simplified form is not as exact but is less cluttered than the full form and shows more clearly the nature of the buffering reaction. 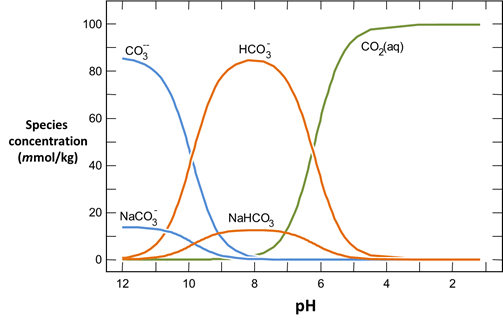 Plot the molalities of carbonate species (on a linear scale) in the second water against pH. Over which pH range does each buffering reaction proceed? 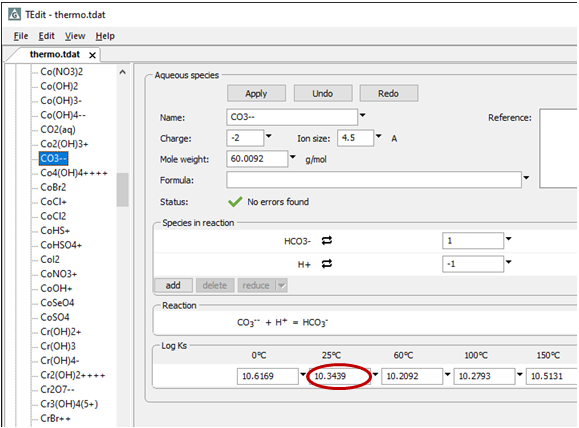 Open the “thermo.tdat” database by selecting File → View. Do the theoretical crossover pHs for the buffering reactions in “thermo.tdat” agree exactly with your results? If not, why not? 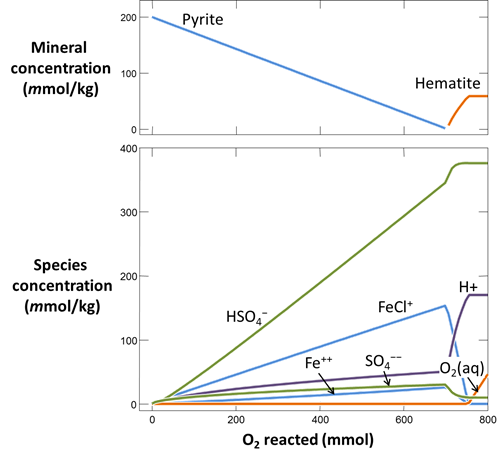 Now let’s consider how minerals coexisting with the fluid might buffer pH and oxygen activity. 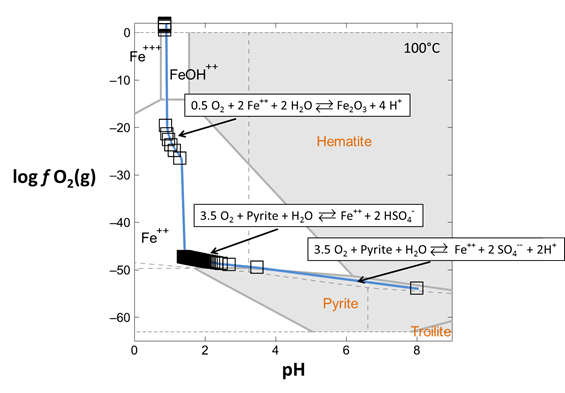 We simulate the effects at 100°C of oxygen infiltrating a formation containing the iron mineral pyrite (FeS2) and a small amount of hematite (Fe2O3). The Basis pane describes the reducing water, at equilibrium with hematite and pyrite. Here we’ve defined a reaction path in which we’ll titrate 800 mmol of O2(aq) into the initial fluid. Click OK, then on the main window select Run → Go. 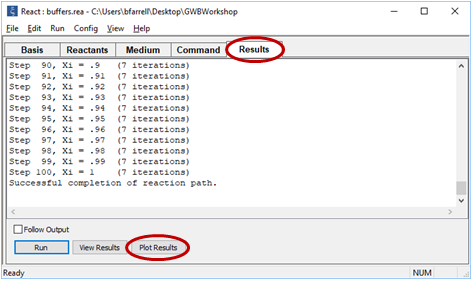 React will move to the Results pane and trace the simulation. Use Gtplot to render the results. 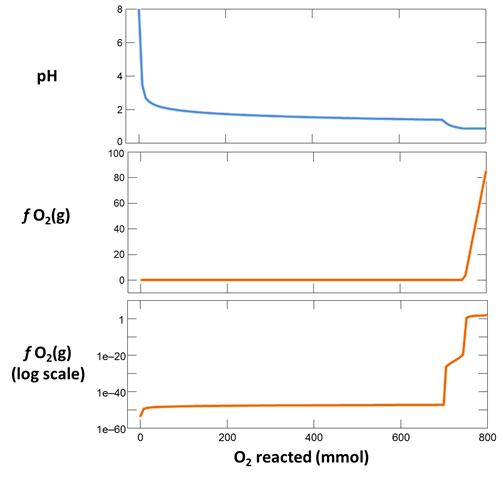 From the slopes of the lines on the plots of mineral mass and species concentration versus O2(aq) reacted, determine the overall reaction occurring in the system. Clearly, pyrite oxidation adds iron and sulfur to the fluid. Eventually all of the pyrite dissolves and hematite begins to precipitate from the fluid, decreasing the concentration of dissolved iron. Plot pH vs. the amount of oxygen that has diffused into the system. Why does the pH change? Also plot oxygen fugacity vs. the amount of oxygen added. The reaction between pyrite and hematite fixes the initial oxidation state. How does the oxidation state of the system change over the course of the reaction path? The pH changes rapidly after the initial addition of oxygen, dropping nearly six pH units, before leveling off. After about 700 mmoles of oxygen have been added to the fluid, the pH drops once again. 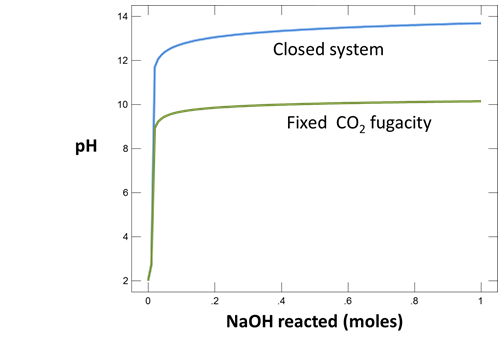 At the same point, oxygen fugacity begins to increase after holding steady for the early portion of the reaction path. The trace command causes Act2 to project your last React run onto the diagram. 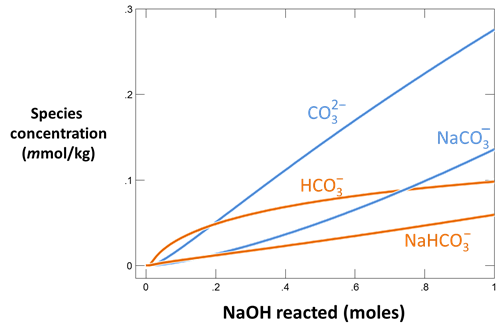 From the resulting diagram, explain the main reactions that occurred in the React simulation. Since the reaction written in terms of HSO4− produces no H+, the shift to lower pH slows and then ceases as the SO4−− in solution is depleted. which further acidifies the solution. Only when the ferrous iron is exhausted does the fluid become fully oxidized. Now we’ll investigate how gas reservoirs can buffer the chemistries of natural waters. First, we’ll titrate NaOH into an acidic water that is initially in equilibrium with atmospheric CO2(g). 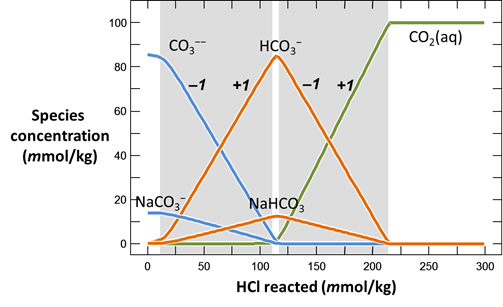 The Basis pane describes an acidic water, initially at equilibrium with atmospheric CO2(g). 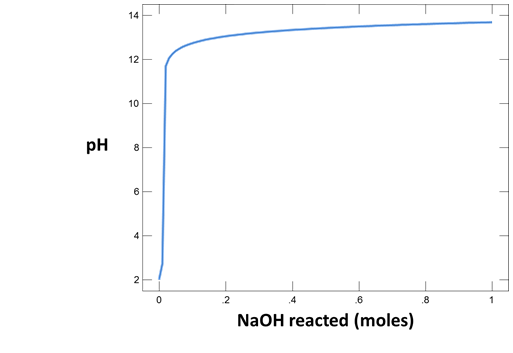 Here we’ve defined a reaction path in which we’ll titrate NaOH into the initial fluid. 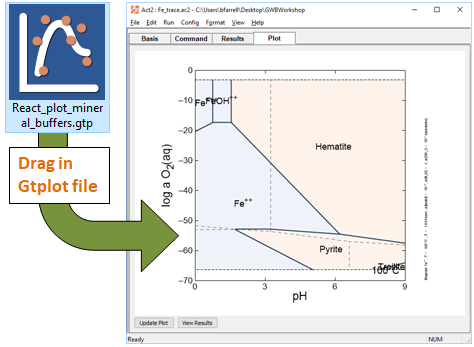 Use Gtplot to characterize the changes in pH and carbonate species’ distribution accompanying the reaction. Write a balanced reaction describing the titration of NaOH into the fluid. What pH buffers were active during the reaction? simply produces OH−, driving the pH to high values. Now consider the same reaction occurring in a water that remains in equilibrium with atmospheric CO2(g) over the course of the reaction. The setting fixes CO2(g) fugacity to its atmospheric value. and select Run → Go. 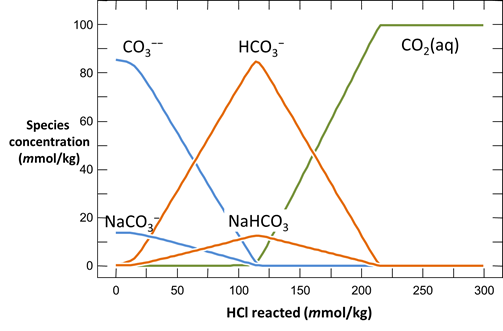 How did the presence of a CO2 buffer alter the reaction path calculated? Explain your answer, using balanced chemical reactions. 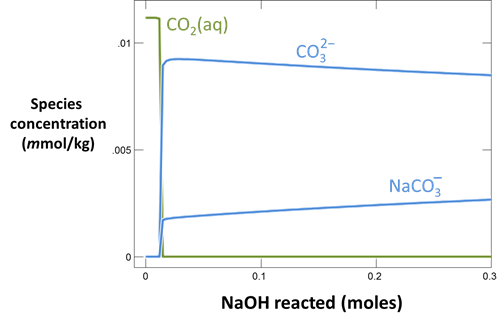 Will continued addition of NaOH exhaust the CO2 buffer? becomes increasingly important. According to this reaction, adding NaOH increases the fluid’s sodium and carbonate contents but does not affect the pH. The CO2, an acid gas, neutralizes the alkaline NaOH as fast as it is added. As long as CO2 is available in the gas reservoir, the fluid maintains the buffered pH. 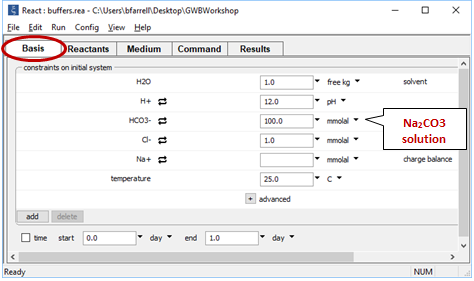 Bethke, C.M., B. Farrell, and S. Yeakel, 2019, The Geochemist’s Workbench®, Release 12: GWB Reaction Modeling Guide. Aqueous Solutions LLC, Champaign, IL, 206 pp. 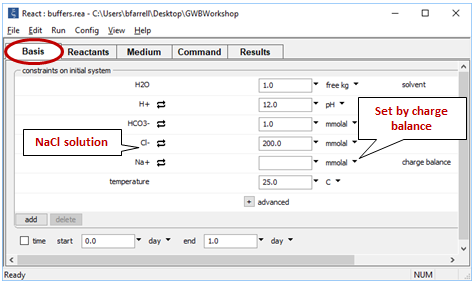 Move on to the next topic, Acidity and Alkalinity, or return to the GWB Online Academy home.